Historical explanations of peacemaking after World War I generally have been dominated by two schools of international relations theory (IR), realism and liberalism. Consequently, historians have tended to focus on the “failure” or, more rarely, the “success” of the Paris Peace Conference according to two well-established sets of rules governing the game of international relations. 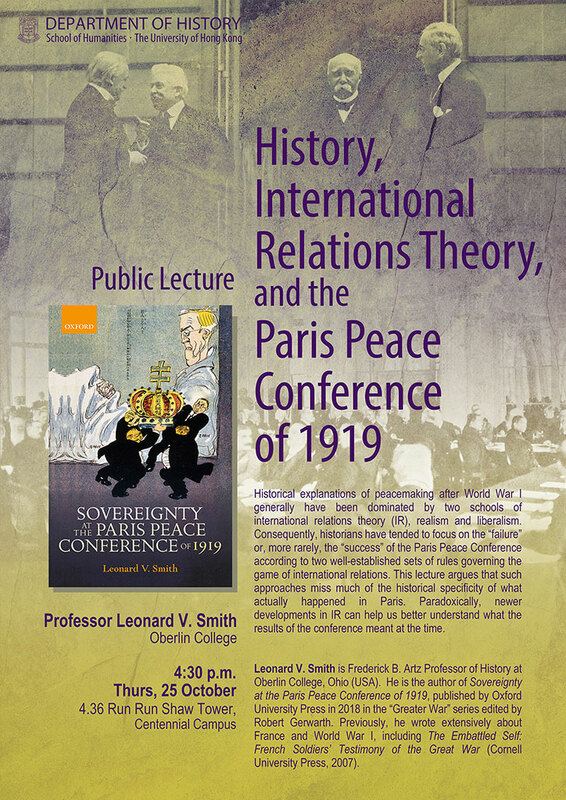 This lecture argues that such approaches miss much of the historical specificity of what actually happened in Paris. Paradoxically, newer developments in IR can help us better understand what the results of the conference meant at the time. Leonard V. Smith is Frederick B. Artz Professor of History at Oberlin College, Ohio (USA). He is the author of Sovereignty at the Paris Peace Conference of 1919, published by Oxford University Press in 2018 in the “Greater War” series edited by Robert Gerwarth. Previously, he wrote extensively about France and World War I, including The Embattled Self: French Soldiers’ Testimony of the Great War (Cornell University Press, 2007).